A short while ago I went to Los Angeles to visit my son, Hunter. His girlfriend, Mallory, suggested going to the Huntington Museum which Hunter could not remember ever having visited and I had not been to for a very long time. The entry fee is not cheap but still less than full fare at the Metropolitan Museum or the Museum of Modern Art in New York and you get a hell of a lot for your money. 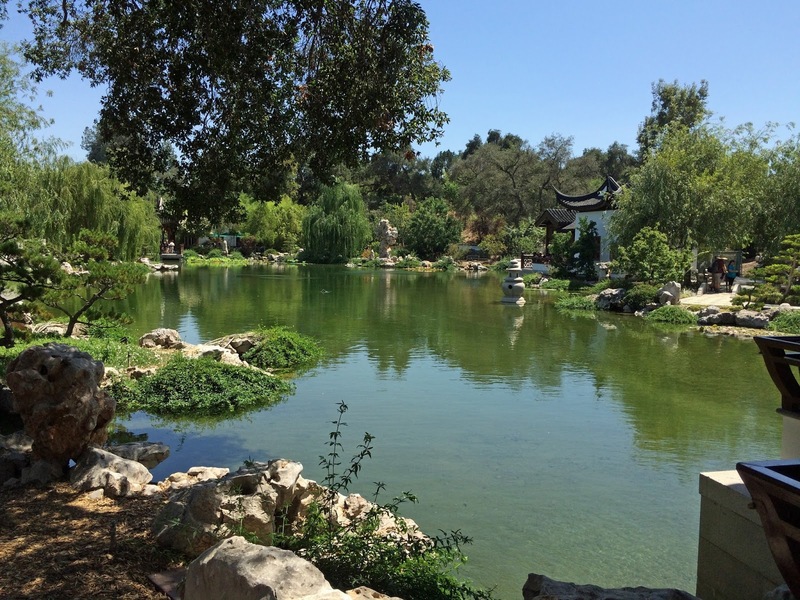 The Huntington covers 207 acres with a great library, 2 museums and a number of gardens. It was founded in 1919 by Henry E. Huntington (1850-1927) and Arabella (1850-1924), his second wife, widow of his uncle. Their fortune came mainly through railroad stock as well as utilities and real estate in Southern California. The Huntington is known first for its library that has 420,000 rare books and 7 million manuscripts. They do regular exhibitions there and the current show is “Magna Carta: Law and Legend, 1215-2015” celebrating the 800th anniversary of this famous document. The center piece is the Huntington's own 13th-century draft of the charter. From my point of view the main event at the Huntington is their 55,000 square foot mansion designed by Myron Hunt finished in 1911. It opened to the public as a museum the year after Henry Huntington’s death. It has a major collection of Old Master paintings and decorative arts with a large emphasis on English art. I remember being at the Huntington with Penelope and a museum director and suddenly both of them yelled “Wow!” at the same time. Of course, I immediately went to see what was so fabulous as well. I found Penelope on the floor staring at a piece of French 18th century furniture and the director standing looking at the painting above it. Unfortunately, I could not find these pieces this time to show Hunter and Mallory. The most famous work in the collection is a full length portrait by Thomas Gainsborough called, “The Blue Boy” sold to Huntington by the famous art dealer Sir Joseph Duveen from whom he bought many pictures. Though we toured these galleries I wanted to see things that I had not seen before. 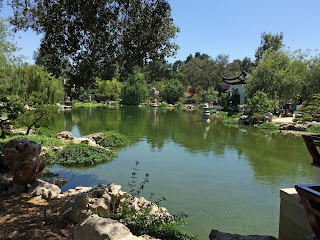 There are some 15 gardens and we visited just one, the Chinese Garden, which is not just a bunch of plants but an entire architectural setting, with several places to sit and get away from the hot Southern California sun. 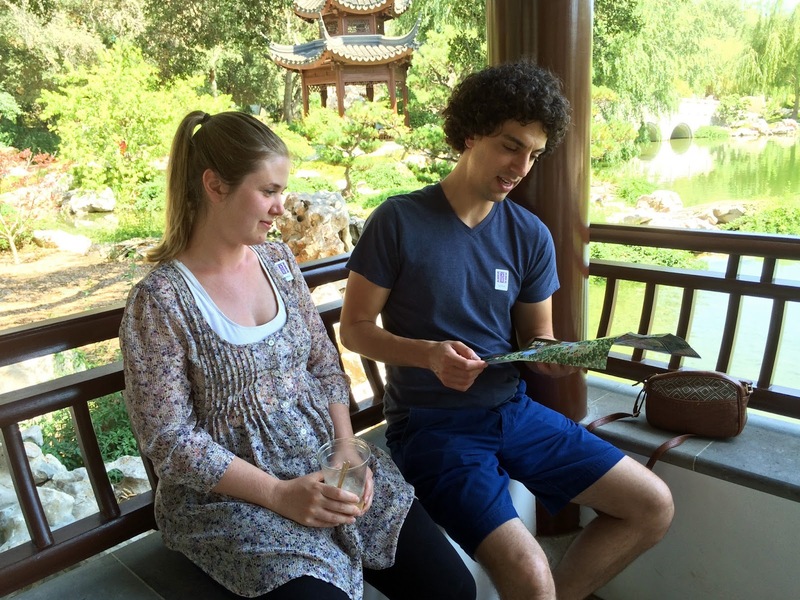 Called the Garden of Flowing Fragrance, Liu Fang Yuan, it is among the largest Chinese-style gardens outside China. Architects and artisans from Suzhou, the renowned garden city of southern China, worked alongside California builders and gardeners. It is a true oasis that would be a perfect place to picnic but it is not allowed in the park though you can bring your own food to an area of outdoor tables and chairs at the entrance to the estate. 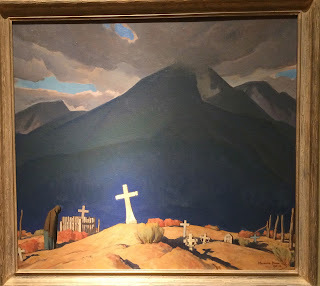 Though I had been to the Huntington in the last 20 years I was not aware of their growing collection of American art. The Huntingtons did have some American paintings but they were mainly early American art that related to their great English collection, which was their first love. In 1984 the Virginia Steele Scott Galleries of American Art were opened and Ms. Scott kicked off the galleries with a donation of 50 paintings. One learns that when one travels one must be prepared for disappointments and in this case a number of the galleries were closed for a major renovation. A goodly number, however, remained open with plenty of 19th century art to see. 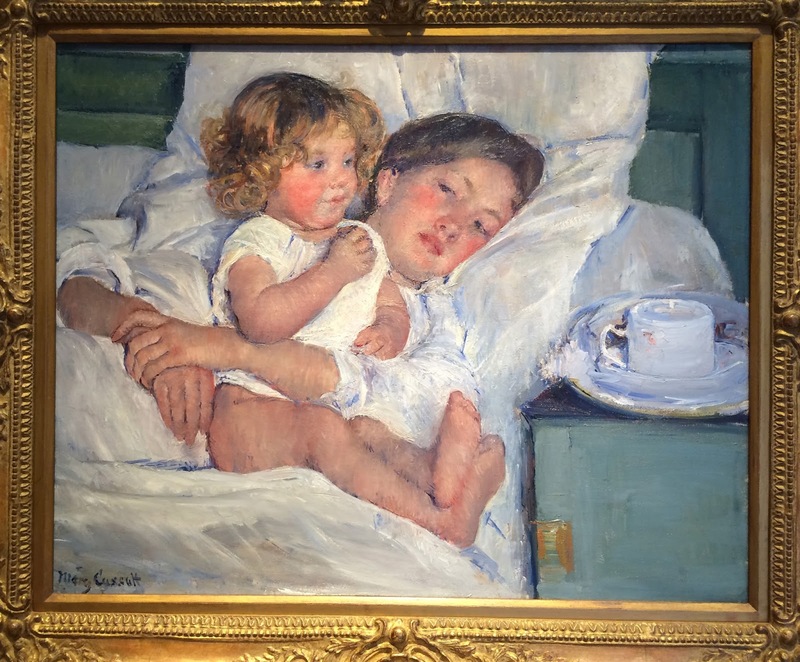 Here the most famous painting is by Mary Cassat (1844-1936), “Brealkfast in Bed” (circa 1894) donated by the Virginia Steele Scott Foundation. Always, being interested in decorative arts I spotted a dining table and chairs designed by Frank Lloyd Wright (1867-1959), in a gallery of Arts and Crafts furniture. As I may have said before I had been prejudiced against American art by both my family and professors but over the years I have grown to enjoy it more and more. I also like artists when they are painting their own studio and here is a marvelous example of William Merritt Chase’s (1849-1916) “The Inner Studio, Tenth Street”, 1882, also given by the Virginia Steele Scott Foundation. There are also paintings by artists that would be more familiar to Southwest readers such as Robert Henri and Georgia O’Keeffe. I was amused to see that of two loans by O’Keeffe the better one was in the mansion among the European works, where it was completely out of place. I wondered if the lender insisted upon it. Another artist from these parts is Maynard Dixon (1875-1946) born in California travelled through Arizona and New Mexico and had a winter home in Tucson. I know you can find his paintings at the Medicine Man Gallery both in Tucson and Santa Fe. 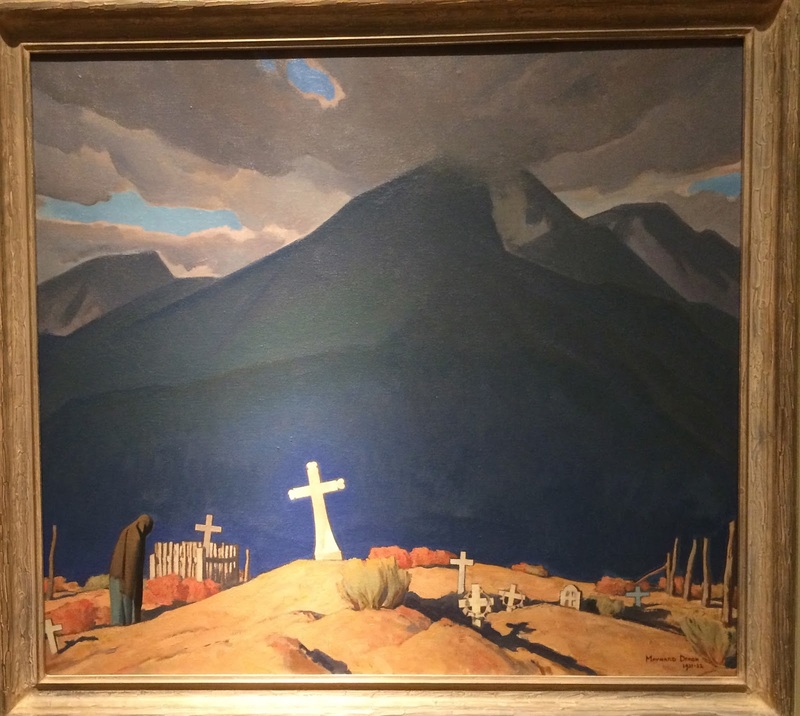 Here is a painting Campo Santo (1931) near Taos, NM lent from a private collector. The picture totally captures the incredible skies and scenery of the southwest… and people ask me why I love it out here! Yours is thd best blog on the internet. Can i frame you comment, Nick? Sounds like you are in a nice place too!